What IS Going On With Captain America’s "New" Uniform? I’m on the record with not being in love with what we were being told was Captain America’s new threads for “Captain America: The Winter Soldier.” It’s not a bad-looking getup in and of itself, mind you, it’s just… yeah, it’s the lack of red and white in there. That matters, not just aesthetically – he’s Captain America, not the Blue-Denim Power Ranger. 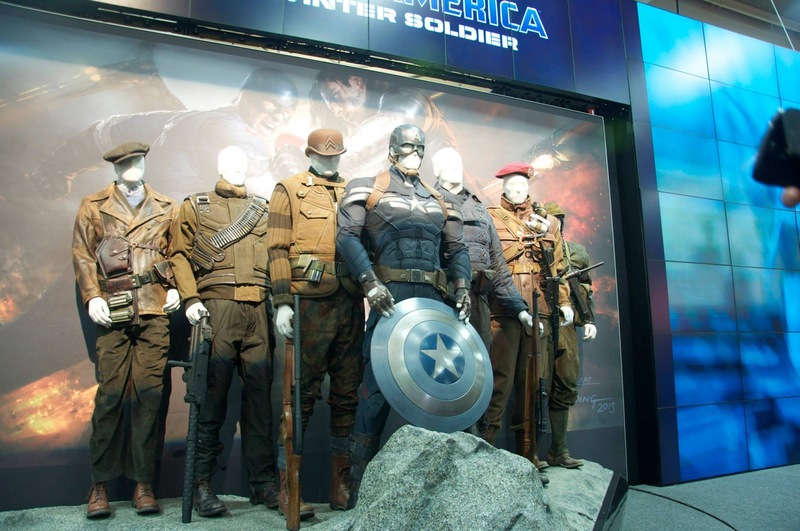 And it’s especially unfortunate, since the original concept-art for the movie was showing off a really good-looking fusion of the WWII and Avengers-era costumes. That’s an official display from Marvel/Disney’s display for the film at SDCC. Why is he standing with The Howling Commandos (you can tell it’s them, because that’s Dum-Dum Dugan’s bowler hat) from the first movie? 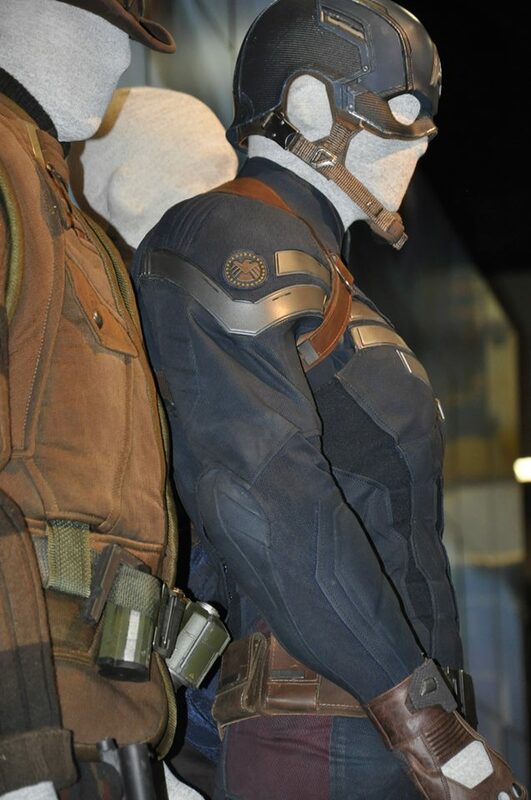 Is it just gag for the display (apparently it rotates around into an identical version but with Cap in his WWII era uniform and pre-vibranium shield)? It’s probable that the film will use flashbacks to WWII to help remind us all who [REDACTED] was, is the blue outfit something from that period used to help us keep past/present scenes straight (or vice-versa?) I will say that the S.H.I.E.L.D. patch looks old-timey: Brown and gold, with a WWII-style right of stars. Will we be seeing the founding of S.H.I.E.LD? One particular guess I keep seeing floated around is that since this and “Thor 2” are supposed to be the (thematically) “darker” movies this cycle (the “Empire Strikes Back” rule that mid-trilogy entries are dark and end on bleak notes,) this one will be about Cap getting all disillusioned about present-day political/military/spycraft business – i.e. he starts out working with S.H.I.E.L.D. or the Government in official capacity but eventually braces against it (maybe they lied to him about [REDACTED]?) and goes off on his own, and the blue get-up is for his “working for The Man” phase? Maybe we’ll find out more when Marvel/Disney’s official panel stuff hits later tonight. From The Creator of "Family Guy" And The Director of The Hayden Planetarium. No, Really.